On May 30th, Peace Corps Volunteers, staff, and a few Colombian friends celebrated Asian-American and Pacific-Islander Heritage Month at the Peace Corps office. President Obama declared May to be a celebratory month for those cultures and encouraged observation with appropriate activities and programs. Stephanie Sheffield and I both have Filipino heritage and have traveled to the area. 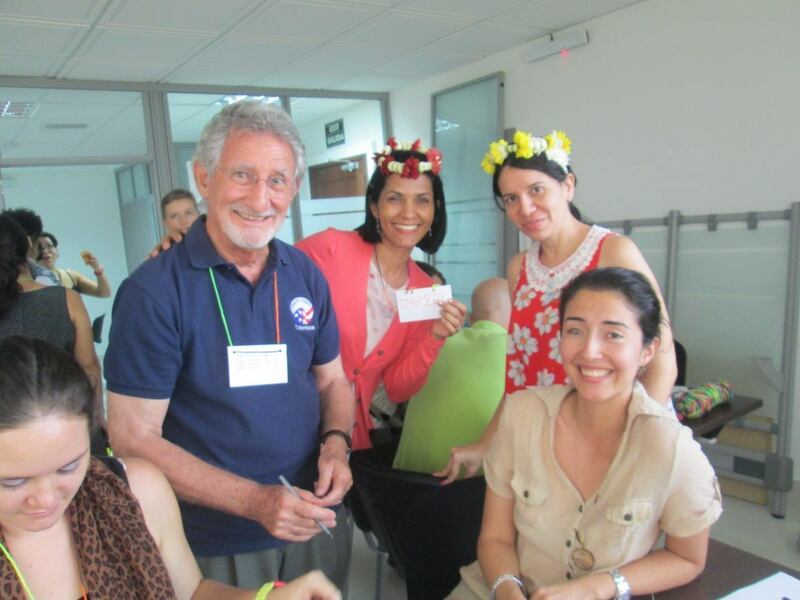 Considering Peace Corps Goal Two–To help promote a better understanding of Americans on the part of the peoples served–we thought it would be useful to share our cultural background with our new Colombian colleagues and friends. The event included many opportunities to engage with different Asian cultures. Upon entering, Tiara McCarty, who studied in China, welcomed visitors. Then, visitors made name tags in the Korean alphabet Hangul thanks to Sarah Shaw, who taught English in Korea before entering the Peace Corps. 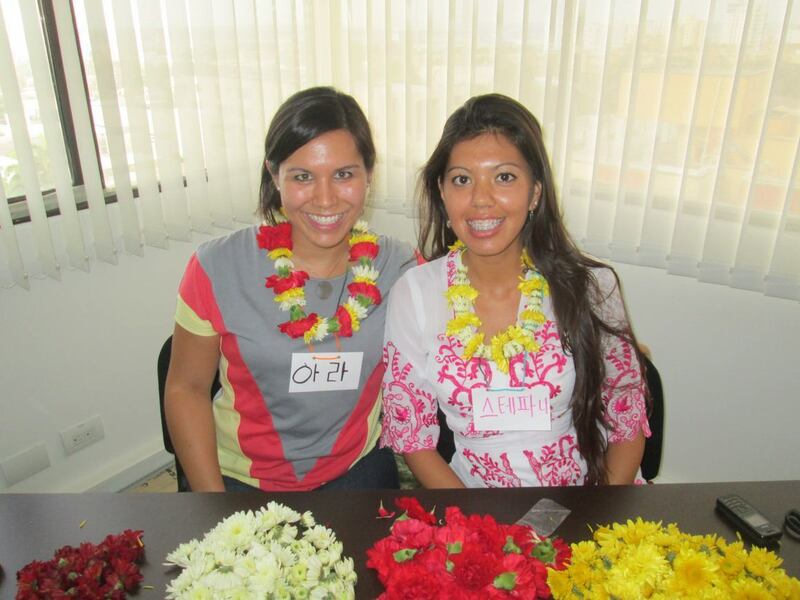 Stephanie, who lived in Hawaii for a time, helped visitors make Hawaiian leis with live flowers. Angela Lopez, who studied in China, offered fun trivia games to talk about Asian culture. I presented information on The Philippines and found a Filipino restaurant in Barranquilla to cater the event. Those of us who have lived or traveled through Asia contributed to a fascinating slide show that played throughout the event. We were happy to see over 30 people attend the cultural event and learn more about a region of the world different from where we are living and serving. Doctor Charo said, “In my 20 years of working with the Peace Corps, I have never seen something like this done before. 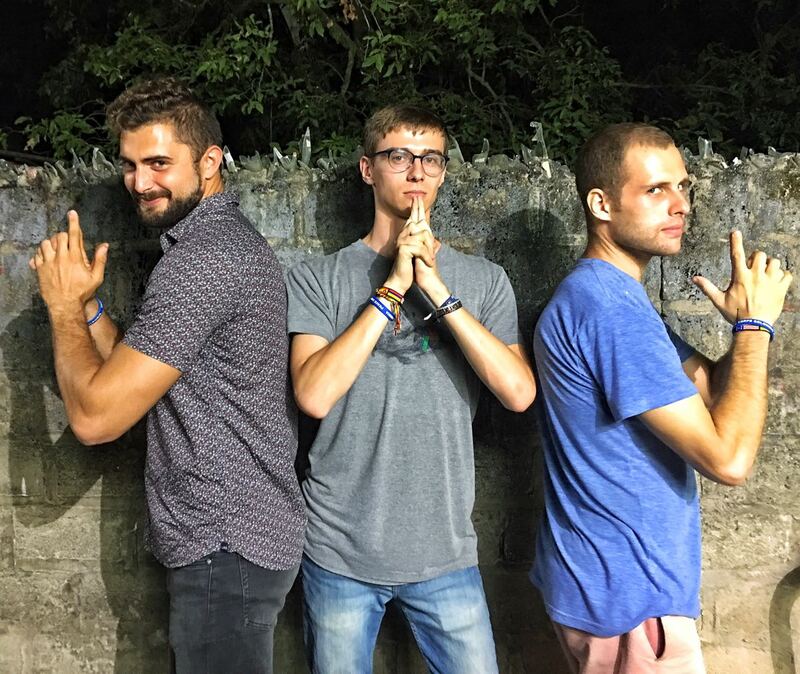 Good job!” As we know, Peace Corps Volunteers come into their service with various backgrounds, and it was a pleasure to be able to bring some of that to Colombia. A special thanks to Peace Corps Colombia who supported this first-time event, and thank you to the Volunteers who helped out to make it successful! We hope visitors learned and experienced something new.